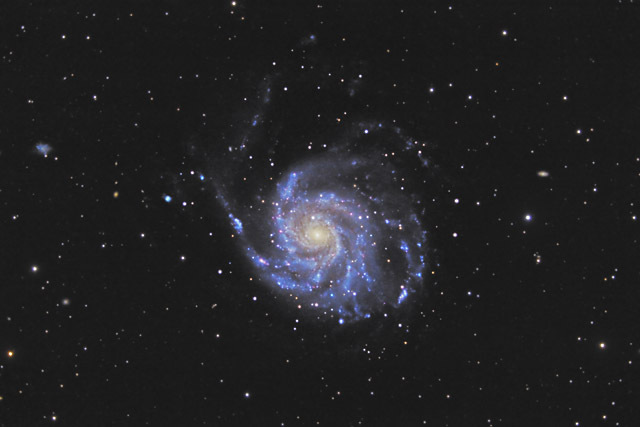 M101 is a large face on spiral galaxy that is about twice the size of our Milky Way Galaxy. This beautiful galaxy has a large number of H II regions - red hydrogen nebulae where star formation is taking place. 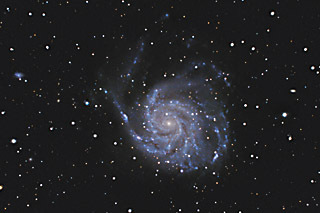 In this image, one of M101's companion galaxies - NGC 5477 is easily visible in the upper left at about 10 o'clock. In this photo, North is up. This image is cropped to 72% of the original full frame. Software Used Images Plus 4.5 for camera control, calibration, stacking, digital development, multiresolution sharpening, smoothing and noise reduction. Photoshop CS5 used for levels and curves, color balance, high pass filter, star shrinking, saturation adjustments, lab color, screen mask invert, and noise reduction. Gradient Xterminator for gradient removal. Carboni Tools for additional saturation adjustments, noise reduction, and smoothing. HLVG for additional color correction. Notes I had imaged this object last year as the first object with my Canon 20Da. At the time, I was not autoguiding, so my subexposures were limited to 45 seconds. While my image last year turned out fairly nice, this year's version is much improved. Its satisfying for me to see clear evidence that my image acquisition and processing skills are advancing.